A tyre which is more fuel efficient helps reduce your driving costs and CO2 emissions. There are seven categories, from A, the most efficient which means you will use the least amount of fuel for your journey, to G, the least fuel efficient. Choosing A-rated tyres over G-rated tyres could reduce your fuel consumption by up to 7.5%. This is the amount of noise made by a tyre when it rolls along the road surface. The tyre’s exterior noise emission is shown by a series of black waves. Three black waves indicate that the tyre produces the most amount of noise on the scale. 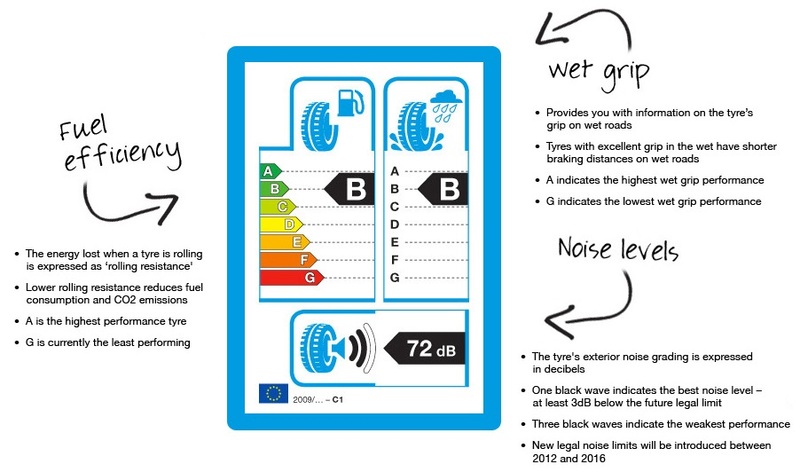 One black wave indicates the tyre emits the lowest level of noise on the scale.